There is a cure for one of the top five causes of death in inner city children. And best of all, this cure is not a new drug or surgical procedure: it is a kick board and goggles.” These are the words of Ben Damazo (pictured above, left), the man who made a mere vision become reality on our Loma Linda University campus. Ben is a student in the School of Medicine and barely has enough time to study, but has chosen to devote himself to a new program sponsored through the CAPS office and Healthy Neighborhood Projects (HNP) this year: TIGERS Water Safety. This program focuses on six main points as highlighted in the TIGERS acronym: T = Touch the bottom; I = Investigate for danger; G = Go feet first the first time; E = Ease into the water; R = Release the wall; and S = Swim safely using good technique. Ben is a long-time water safety advocate. Growing up in a small town surrounded by lakes in Northern California, Ben began spending time on the water at a very early age. He attended his first swim classes when he was six months old at “Mommy and Me,” swam competitively from elementary school through college, and has worked at as many swim camps as possible. After some close friends suffered tragic accidents due to lack of knowledge about water safety, Ben felt compelled to advocate the practicing of safe water techniques and ended up assisting his first water safety class at fourteen years old. Just a year ago, Ben was inspired again to advocate water safety after reading an article about inner city drowning deaths. Though not knowing how to solve other public health concerns like gun violence or car accidents, he did know how to help kids have fun safely in the water, so he proposed a water safety camp. Knowing that Loma Linda University had the proper aquatics facilities as well as service-oriented students to help volunteer, he had a good feeling that such a program could be a real possibility. What Ben originally envisioned turned into the TIGERS Water Safety program, now offered through CAPS and HNP at the LLU Drayson Center. Over 40 kids registered, they are all now receiving free lessons by certified swim instructors, acquiring valuable skills to own for the rest of their lives. Each child will be given a stuffed tiger tail upon completion of the program to remind them of the six methods of TIGERS water safety: touch the bottom, investigate for danger, go feet first, ease into the water, release the wall, and swim safely. The two-week program will take place again in the Spring. It only takes one person to make a difference, as shown through Ben Damazo. It simply starts with an idea, but with the proper initiative it can become more. To make a difference in your own community, begin with what inspires you; form an idea of what can be done, and follow Ben’s example of taking initiative to address the need you see. A healthy community starts with you. 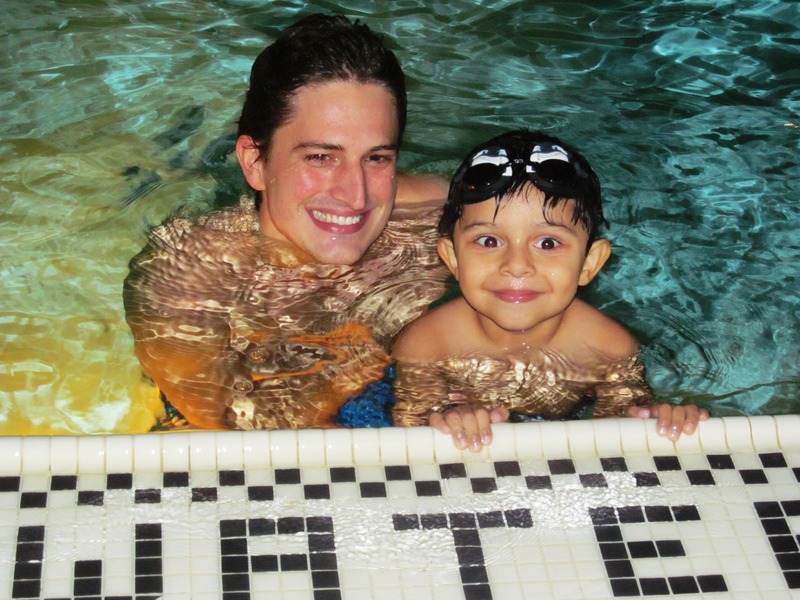 "Volunteer teaching children about water safety at Drayson Center pool."